for £5 postage paid World-wide. In spite of the music, which is of a high standard, this disc is as difficult to recommend as it was to review. The label is Tactus, a well-established Italian company (many previous releases have been reviewed here on MusicWeb International), and to be fair to it, this is only really a sampler - 15 tracks taken from 15 CDs in their range; it's well-packed at 76 minutes. You also get chronological variety - pieces from 16th century, Andrea Gabrieli, to the still-living Guido Donati. But beyond that there are problems. Most importantly, there's almost no information about the music. Literally all you get is the track number, composer's name (with most first names randomly abbreviated), work title - or part of it! - the organist's name, track length and the catalogue number (you surmise) of the disc from which the track is taken. And a magnifying glass would be handy to read anything beyond composers' names. What you don't get, and probably wished you did, is any information about the composers - you may recognise "JS Bach", "Gioachino Rossini" and "D Scarlatti", but who wouldn't like some more data about "A Padovano", "ME Bossi", "G Donati" or Padre D Da Bergamo"? You won't even find the latter two in the New Grove. And would it have harmed to at least have provided birth and death dates? The same goes for the organists: who is Francesco Tasini or O Tenerani? Some might know, but most won't. Worst of all for organophiles, probably, is the total absence of any information about the instruments or recording venues! The programming too is a trifle disappointing. From the first track to the last there is a basic chronological progression, but this plan suggests an otherwise random selection for the disc, with the first half consisting entirely of shortish slow pieces. Moreover, the CD is not all that useful as a sampler: many of the recordings are too brief and/or too unrepresentative to tell you very much about either the featured composer or the original disc the track comes from. And only three of the tracks come from 2010 releases; one indeed dates all the way back to 1999! The recordings themselves are generally of a good, though by no means exceptional, quality. There are some exceptions: the Scheidemann, for example, has some sound distortion and background crackling. There are minor aural distortions too in the Davide, Rossini and Domenico Scarlatti pieces, and the microphones are rarely in ideal locations on any of the recordings. Brief notes on all the individual tracks follow. Annibale Padovano's Toccata del 6. tono comes from a CD (Tactus TC526601, published 2010) of the Complete Organ Works of Padovano and his contemporary Bertoldo Sperindio. It is a virtuosic and moving work for all its brevity, but Marco Ghirotti's fancy playing is not fully appreciable because of unbalanced microphones. The recording was made in the Chiesa dei Frati Francescani Minori of San Bernardino in Verona. Andrea Gabrieli's Canzone "Qui la Dira" (not "Diura", as the CD says) is a simple, only mildly interesting piece, not really typical of his genius. It is taken from Tactus TC550004, The Organ in Italy Between the Renaissance & Baroque Periods, released in 2005. J.S. Bach and Heinrich Scheidemann are the only two non-Italians featured on the disc, and whereas Bach's work has an Italian link - Antonio Vivaldi - it is not obvious what Scheidemann, a north German, whose main influence was his teacher Sweelinck, is doing on a CD entitled A Journey Through Italian Organ Music - although Italian polyphony certainly had some effect on his music. What this sampler rather unhelpfully entitles "Allegro" is in fact a complete three-movement concerto in A minor, transcribed by Bach - BWV593, after Vivaldi's op.3 no.8 RV522 - and the longest piece on the disc. It comes from a recital by Roberto Loreggian of Bach transcriptions - Tactus TC672215, released in 1999; why put it on a 2010 sampler? On Tactus's rather ramshackle website you don't even get a track-listing for this particular disc, though it does tell you at least that Loreggian is playing the Ahrend organ of the Basilica di San Simpliciano in Milan. Scheidemann's piece, one of his many chorales, is played on the Ahrend & Brunzema organ of the Oude Kerk in Amsterdam (Tactus TC57001, released 2008). This track above all suffers from imperfect sound quality - the disc it comes from reveals it to be an AAD digital re-mastering; not a particularly good one at that, though the original microphones sound rather ill-advisedly placed in any case. Girolamo Frescobaldi is one of the best-known Italian organ composers of the 17th century. The Ricercare no.6 comes from Book I of his very successful Recercari et Canzoni Franzese, published in 1615. The CD this is taken from (a 2010 release, Tactus TC580608) gives you the whole book (10 Ricercari and 5 Canzoni); it was recorded in 2009 on the Baldassarre Malamini organ (1580, restored 2009), at the Chiesa Parrocchiale di San Procolo in Bologna. Tarquinio Merula's Canzon La Monteverde is taken from a 1999 CD entitled Complete Works for Organ (Tactus TC591301) - though presumably, at barely an hour's worth of canzoni and other short odds and ends, this is only the first volume. It's played on the 1526 Giovanni Battista Facchetti organ at the Chiesa di San Michele in Bologna. Again, such a short piece gives hardly any glimpse of this neglected composer's true brilliance. The Toccata con lo Scherzo del Cucco ("with the cuckoo scherzo") by Bernardo Pasquini serves up some unusual - occasionally weird! - birdlike sound effects, skilfully played by Emilio Traverso, part of his recital on a CD snappily entitled The Historical Alari Organ (1773) of the San Matteo Abbey in Genova: Italian Masterpieces of the 1600s & 1700s (Tactus TC600007, released 2007). Though not really renowned for his organ music - of which he wrote relatively very little - Alessandro Scarlatti's Toccata Aperta in A minor is one of the most inventive pieces on the disc, in spite of its chiefly didactic intent. It is taken from the Complete Keyboard Works, vol. III (Tactus TC661913, released 2010). Alessandro's equally illustrious son, Domenico Scarlatti, is represented on this sampler by his Essercizio (i.e. Sonata) in D minor K.77 - Scarlatti's original additional continuo line being presumably subsumed by the organ. The recording is noisy - too much machinery can be heard in places, and there is some aural distortion. The Sonata is played on the 1787 Pietro Cavalletti organ, and comes from Tactus TC681907, a CD of sonatas attributed to Scarlatti and some by Lorenzo de Rossi. Giovanni Battista Martini's Adagio, from his Keyboard Sonata no.6, is a slow, reflective piece, the appreciation of which is not helped by a fair amount of background hiss. Taken from Tactus TC701304, 6 Sonatas for Organ & Harpsichord, released in 2001. Father Davide da Bergamo's short, cheeky Allegro Moderato comes from a CD entitled Music for the Liturgy (Tactus TC792901, published 2008). It appears to be the first movement of four of a Versetto in D - once again, the information provided by the Tactus website is hardly the epitome of clarity. It is played by Marco Ruggeri on the Serassi organ of the Basilica di S. Maria di Campagna in Piacenza. Davide was said to be the greatest and most famous organist (though not composer) of the Risorgimento. The famous Barber of Seville Overture of Gioachino Rossini comes across surprisingly well on the organ, at least in this transcription for four hands by an unnamed one; not Rossini, who wrote virtually nothing for the instrument. It may be a relatively pointless transcription, but it certainly makes for an entertaining encore piece for the debonair recitalist. It comes from Tactus TC791805, Sinfonie for Organ four hands, released in 2009, which, despite the title, is a disc of Rossini's operatic overtures. Like Rossini, Ottorino Respighi wrote hardly anything for the organ, which, on the strength of his Prelude in D minor, is a great pity. It's a noisy work, but in a nice way. 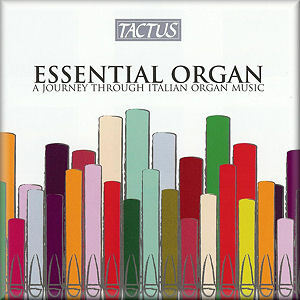 It is lifted from Tactus TC871802 (2002), Respighi's Complete Works for Organ. Marco Enrico Bossi was a composition student at the Milan Conservatory of Amilcare Ponchielli, and in his time widely admired - in Italy, at least - as an organist, teacher and composer. His opus 95 Scherzo is taken from volume one of Tactus's complete organ works (Tactus TC862711, released 2009 - four volumes available in all) of this under-recognised composer. This, along with the Respighi Prelude, is probably the work most likely to impel the music-lover to seek out the original CD. The track is faded out unnecessarily quickly at the end. The final work is the Prelude & Boogie on a Theme by Leonardo, by Guido Donati and taken from Donati Plays Donati (Tactus TC940401, published 2008). If you haven't heard of Donati, the Tactus website will tell you that he "is not simply an organist (albeit a fine one) who composes on the side, cultivating a sort of private hobby in his own personal hortus conclusus. On the contrary, he is a D.O.C. composer who fearlessly takes on the grand genres and loves challenges. Donati possesses a solid training, a perfectly respectable palmarès, and a catalogue of compositions ranging from chamber to orchestral and theatrical works". Make of that what you will (or can) - the work is in any case short, quirky and interesting, as befits such a title.